When it comes to a wedding tipping can become quite confusing. The key is to read your contracts closely for gratuity and service fees. When these are applied to a bill, it is not necessary to include a tip. Traditionally, the best man handles all of the tipping on the day of the wedding. However, if the best man cannot do this then assign someone you trust. Envelopes with the recipients name on them will make this job easier for them. Also, remember that tips can add up quickly. It is a good idea to include them in your wedding day budget. Wedding planners work for a set fee and do not typically expect a tip. 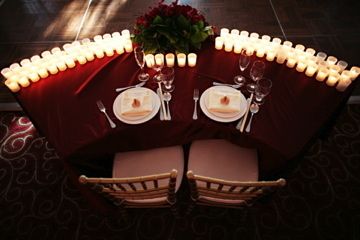 If you feel your wedding planner did a wonderful job, you are more than welcome to tip them. Also, a letter of recommendation or professional photos from your photographers will go a long way! It is not customary to tip your Seamstress/Dress Fitter, but if they did an extra special job you may want to. When to Tip: After final fitting. This one is one were gratuity is definitely expected. Tip as you would at a normal visit to a salon but add a little extra if they did an extra special job or if there was a crisis. If the delivery or set-up fee is not included in your contract, then the staff will expect a tip. Check the fine print of your contract. When to Tip: Drop off cash envelopes the day before the wedding to the catering manager so the person accepting deliveries can deliver the tip. Typically there is a flat rate for the ceremony musicians, so you do not have to tip. However, if the musicians are volunteering their services or have done an exceptional job you should tip them. These guys do not expect a tip. All of their services are included in the price. If you want to repay them for a job well done, then you are more than welcome to tip them. You may also reward them by placing a big print order! A tip is expected if it is not already included in the price on the contract.r. A service or gratuity charge is almost always built in to the food and drink fee, so check your contract. If the gratuity is not included, tip as follows. When to Tip: After reception. It is not necessary to tip the servers if you have already paid a gratuity in your contracted price. Check to ensure whether a service charge is included in the caterer’s contract. If not tip as follows. Standard Amount: Tips should range from $1 – $2 per guest. Usually you will find that the bar manager will add a service charge to the bar bill. If this is not the case then you might want to tip the bartenders. Your cake decorator does not expect anything above the contracted price. However, if you would like to give them a little something extra you may. The same goes for the florists as for the the cake decorator. They do not expect anything above the contracted price. However, if you would like to give them a little something extra you may. Do check to see if a gratuity has been included in their bill as this is often the case with transportation fees for weddings. If not or if you want to reward them for their service on your wedding day then tip as follows. When to Tip: At the end of the last ride. Let your favors do double duty by serving as your centerpieces. The favors themselves may cost a little more but you will save money in the end making them serve double duty. Bridal Party Tees is always looking for a way to make your wedding planning easier. Therefore, we have created a free wedding budget calculator. 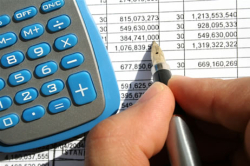 All you have to do is simply change the amount in the budget column and fill out the estimated and actual amounts and the work sheet will do the rest for you! We hope this is just another way we can help you with your wedding planning! Some of us aren’t endowed with trust funds or uber-rich parents. If that’s the case, it means preparing for your wedding can be something of a stressful chore. With the average cost of weddings these days topping $20,000, it certainly can cause some worry. But don’t fret – there are many ways to cut costs and still have a fabulous wedding. Here are some tips on how throw a classy wedding on a dime. You will clearly need to save, save, save if you’re going to foot the bill for your wedding, but the good news is that some of the costs can be financed. In the unfortunate addition to racking up some credit card debt, you can rack up some old-fashioned bank-loan debt, as well. It may sound somewhat formal and heavy for such a happy occasion, but it’s pretty common to take out a loan to help cover your expenses. And lots of banks have plans to suit your financial needs. But a warning to the wise – while it’s easy to get a loan, it’s also easy to fall into a money-sucking trap. Try to go for loans that allow for a short payback term to reduce the amount you’re spending on interest and stay on top of your payments!!! Don’t let the most joyous day of your life lead you to financial ruin. 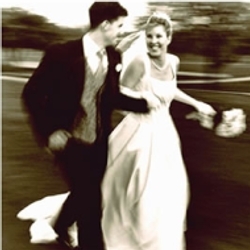 Loans can get great if used properly, but its advisable to pay with saving for the wedding… be responsible! Bridal Loans.com: Bridal Loans is a California-based company that offers loans between the amount of $1,500 and $25,000. They also offer payment plans that extend from 12 to 48 months, so you can pay the loan off as fast as you want. With an interest rate at 12.9 percent, it’s better to pay these loans off quickly. But, if you’re in a bind, this company can definitely help you meet your needs. Bank of America: This mega-bank offers loans of up to $50,000, which can be spent on flowers, cakes, dresses, or food. You won’t have to put up any collateral to qualify and you’ll pay no annual fee. While interest rates fluctuate, they do go as low as 8.99 percent. American Unsecured: This company makes it easy to get a loan for any amount up to $50,000. You can pay the borrowed amount off over 24 to 84 months. The long loan term relieves the pressure, and the application is easy to fill out. Interest rates here can rival those at Bank of America, going as low as 8.99 percent. Citibank: Citibank, like many banks, has what it calls a Flex Line of Cash, which works just like a home equity loan. Offered at an interest rate of 9.99 percent, you can take out a loan to spend on whatever your heart desires. The loan term is automatically set at 60 months, but you can change that to make it shorter. Loan Back: This easy-to-use service offers low interest rates and super-detailed plans. Simply enter the amount you’re borrowing and the reason for the loan and the online tool will calculate your monthly payments immediately and let you know the total amount of interest you’ll pay over the term. Convenient, reasonable, and hassle-free. Capital One: Capital One provides very flexible personal loans that can be used for whatever you want. Payment terms are flexible and the application can be completed online. The interest rate of 6.99 percent is also pretty low in comparison to other lenders and you’ll be guaranteed to pay the same fixed amount each month. E Loan: This company provides consumers a variety of personal loans up to $25,000 without homeownership required. The detailed and helpful website allows you to do most of the math online and also fill out the application. No annual fees are required, either. America First: America First offers flexible personal loans that can be payed off over many different lengths of time. Clearly, the longer you stretch it out, the lower the interest rate. And like most lenders, rates will increase depending on your credit history. But it’s a credible credit union with a plethora of options for the consumer. Wells Fargo: Wells Fargo is another national bank with a solid reputation for providing flexible personal loans. And if you pay off the loan directly from your Wells Fargo account, you’ll pay even more. Definitely worth some research here to see if it’s the bank for you. Bank Rate: If you’re still not convinced that any of these options are up your alley, try this website that allows you to see what’s available. Compare interest rates and graph the rate trends all within a few minutes. By using an objective comparison site like this one, you’ll be confident in your choice. So now you know that if push comes to shove you will be able to get some financial assistance for your wedding in the form of a loan. But you may want to save that for a last resort. The very first thing you need to do when planning a wedding on your own dime is start saving! You many not think that you’re a spendaholic, but you would be surprised at how many extra costs you can cut out if you just put your mind to it. Here are a few ways to start fattening up your bank account. Track Your Spending: All debt gurus will tell you that you can’t start being smart about your money until you understand why you are so bad with it in the first place. For one entire week, write down everything that you spend money on. You can use a simple piece of paper or go more formal with software like Excel or Quicken. At the end of the week, study your habits and make notes about where you can cut out the extra dollars. Cut Out Extras: Now it’s time to tighten the belt a little. Stop going out to eat so much and start cooking at home, rent movies instead of hitting up the theater, make coffee in the morning instead of stopping at Starbucks. While you don’t have to totally deprive yourself, if you are spending money on entertainment or unnecessary items every day you can save a fortune by taking a more frugal route. Conserve Energy: Unless you’ve been living under a rock, you know that energy costs these days are through the roof. There are so many things you can do to shrink your utility costs. Make sure all of your lights and fans are turned off when not in use, turn the heat and air conditioning down, and unplug appliances when they’re not in use. Making small changes like this will impact both your billfold and your carbon footprint. Bike: Another way to save bukus of money is by changing your transportation habits. Park that old gas-guzzling clunker in the garage and hop on the bus. Or take your bike instead and get some exercise while helping the environment. Be Responsible: A lackadaisical outlook toward your existing debt can wreak havoc on your finances in the form of astronomical late fees. Examine your credit cards and other financial accounts and see what the late fees and interest rates are for not being on top of your payments. They will add up fast and can easily sneak by you if you are not vigilant. Go Vintage: Forgo shopping trips to Neiman Marcus and Saks. If you need some new garments, check out the local second hand thrift stores and vintage shops in your area. You’ll spend less on clothes and amass a fashionable and unique wardrobe at the same time. Hide Your Credit Cards: You may not want to go totally without credit cards, but you may definitely want to think about at least hiding them or not keeping them on your person. Credit cards encourage indiscriminate spending and will only help you wrack up more debt. Spend money you actually have and you’ll stay above the water, financially speaking. Get a Roommate: If you have a little extra space in your home, consider taking on a boarder to generate some extra income. Or if you live in an apartment or home that is way too big and expensive, move into a more humble abode until after your wedding. Living with other people will cut all of your current expenses in half. Have a Garage Sale: Make some money on the stuff that’s cluttering up your house by holding a garage or yard sale. And don’t fall into the trap of under pricing everything – if an item is special, people will be willing to spend. Plus, haggling is a common occurrence at yard sales, so make sure you start on the high end. Ebay: In the same vein as holding a garage sale, you can also make money by hocking your wares on the internet. Place some high dollar items that you don’t need anymore on Ebay and hold out for the highest bidder. Lots of people make their entire living doing this. Just think what an entire annual salary could do for your wedding budget. Doing it yourself could not be more hip these days. And honestly there are so many things you actually can do yourself. While it may sound daunting at first, armed with a few simple guidebooks and instructions, you can essentially make anything that you would possibly need for your wedding even if you aren’t the craftiest bride. Making things yourself will help you cut costs, while also earning you the admiration of all your guests. Bouquet: Making a wedding bouquet is one of the easiest things to tackle on your wedding accessory list. You may have to wake up extra early on your wedding day, but assembling and wrapping up some flowers is not difficult and actually might be very therapeutic. Stick to flowers that are in season or cheap by nature, like daisies, sunflowers, freesia and Sweet William, to keep costs down even more. Veil: Do you have any idea how expensive veils are these days? If you don’t, you may not want to risk a heart attack by looking into the matter. If you do, enough said. The good thing for you is that veils are extremely inexpensive and pretty darn simple to make, and there are dozens of resource guides to be found online and in fabric stores. Programs and Placecards: If you are planning to have paper items like programs and place cards at your wedding, you don’t have to spend a ton on some fancy graphic designer. These items are just as easy to design and print yourself if you have even the most basic color printer. If you’re artistic abilities are really bad, look for templates online and plug in your personal information! Hair Accessories : So you want some nice beaded accents or ribbon-laced barrettes for you and your bridesmaids? No sweat. Make them yourself by buying the raw materials and a glue gun. Just look for photos of examples and copy it. If you’re having trouble, enroll in a weekend craft workshop and ask the instructor for help. Seat Covers: This one may be a bit adventurous for some and you will definitely need a sewing machine, but it is possible to make your own seat covers and avoid rental fees. However, it may be less hassle to find the basic covers for cheap and then tie on your own ribbons or decorations. Some rental companies loan sheaths for as low as $2 a pop! Do some research and find what’s right for you. Invitations: Just like your programs or other paper products, it’s very easy to make your own wedding invitations. If you are dealing with a large quantity, you may want to outsource the printing, but designing the concept can be done for free. Bring your costs down by using recycled paper. Jewelry: If there’s anything we’ve learned from the plethora of bead stores around, it’s that anyone can make their own jewelry. The same goes for wedding jewelry. As long as your not looking to be covered in diamonds – and given your budget, we’re assuming you’re not – then you can follow any pattern of your choice to make your own earrings, necklaces, and bracelets. This could also be a fun activity for your bachelorette party – everyone makes the jewelry they plan to wear! Bridesmaids Gifts: You’ve got to get them something, but it doesn’t have to break the bank. Plus, a homemade gift is always more special than something store bought. Now that you know how to make jewelry, you could make them earrings, hand paint or decorate some nice picture frames, or make a personalized scrapbook for each friends with details you’re your friendship. Dresses : This money-saving option is not for the meek. Making your own dress requires a lot of time, patience and skill. But if you have those it can be done. Make Your Own Accessories: All you need is a needle and thread to make your own pillow for your ring bearer. Brainstorm about other non-complicated accessories you can cobble together yourself and get a bit crafty. Cutting back on the amount of hired help at your wedding is one solid way you can keep costs down. Here are some general rules to employ so you can pull off a great wedding without working too much overtime. Money Tree: Let your guests help pay for the celebration. 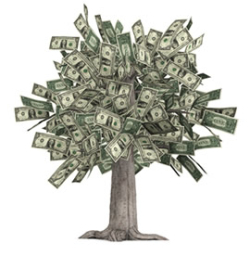 Instead of registering for gifts, register a money tree. Have your guests give you money instead of unnecessary pearl-encrusted picture frames. 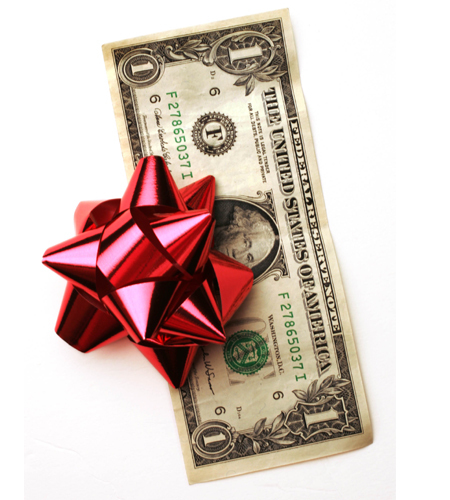 The money tree makes gift giving easy for your guests and beneficial for you. Keep the Guest List Small: This may be easier said than done for some of you, but one way to do this is to limit the affair to close friends and immediate family. Don’t worry about offending your great Aunt Pearl – it’s your day! One way to get around hurt feelings is to hold a very simple reception at your home after the wedding for those who couldn’t come to the ceremony. And if you do have a big list, don’t let friends bring random dates. Cut corners any way you can by eliminating the people who don’t really matter. Be Your Own DJ: With all of the music technology out there today, you really, really don’t need to hire a DJ for your reception. Make a few playlists appropriate for the different settings you will have at your ceremony, have someone press play, and don’t give it another thought. Why pay someone for something you can get for free? Bake Your Own Cake: While catering your own wedding may be asking a bit much, one thing you could easily do is bake your own cake. How hard is it to mix up some batter? You may need some assistance or lessons on how to do the icing skillfully, but there’s lots of resources available online and in bookstores for you to be your own teacher. Get a Cheap Dress: There are plenty of dress merchants who specialize in cheap, affordable gowns that look like they just fell off a designer’s frame. When it comes down to it, you can even find a great, stylish, white dress in your local mall. Keep it simple and no one will even think twice about who you’re wearing on your wedding day. Have a seamstress in the family? Ask them to copy the dress of your dreams for a fraction of the price or in lieu of a wedding gift. Stay Home: Cut out those monstrous event location rental fees by holding your wedding in your living room or your backyard. If you live in a nasty apartment building, consider your parents’ house or the home of a friend or relative. If you can’t think of anyone, hold your wedding at a local state park or other outdoor location that won’t charge you a fee. Make Your Own Favors: Don’t spend a dime on fancy favors – take the chance to make your own! Maybe you’re a knitter and can cobble together some cool coasters or beer koozies? Or maybe you’re just an Average Joe with no real creative abilities. In that case, make a mix CD of the songs that mean the most to you and your hubby. Save on Photography: Ask a friend or remote acquaintance who’s handy with a camera to shoot your wedding and save bundles on expensive photographers. Don’t know anyone off hand? Try inquiring at local photojournalism programs about seniors or grad students who have impressive portfolios. Chances are they’re still looking to add more work to their resume, so you can often get a student to do it for completely free. Compare Prices: If you’re trying to have a cheap wedding, you cannot be lazy. Be super vigilant about comparing the prices of every vendor in town and in surrounding towns. Hit up internet chat boards and ask other budgeted brides what they ended up paying for various services so you’ll know exactly when you’re being scammed or overcharged. Cancel the Wedding Planner: While having a wedding planner may reduce your stress and stand to reassure you that you’re not missing anything important, they’re really not necessary unless you have little-to-no time to do any planning. If you do, however, check out any number of wedding websites. Most offer free online workbook tools and checklists that you can use and follow as a reference for free. Having everything documented will calm you and ensure everything is on track. Online Invites: Save money on design, printing, and postage by sending online invitations to your guests. There are so many web services that make this process easy and that offer fun designs. Also, using online invites saves you a lot of work, because the site will keep a running tally of who is coming to your wedding, who is not, and why. You can also link your invite to your registries, send reminders, directions, all of which make it easy on your guests as well. Do Your Own Hair: Forget the expensive stylists – you’re not Angelina Jolie. But you can still look fabulous for free if you do your own hair. Many hairstyle websites have step-by-step instructions for different styles or you can go chic and simple by wearing your hair down and natural. Even ponytails are now popular options for wedding dos, so don’t sweat the small stuff. Do your Own Makeup: You do your own makeup every day, and chances are you don’t look hideous. What special magic is a makeup artist really going to pull beyond making you look like someone you’re not. Study up on some techniques and do your makeup yourself. If you’re really struggling, enlist the help of your mom or another friend. Have a Brunch: Eggs are so inexpensive they’re almost free. In general, breakfast foods cost a fraction of the cost of hearty, gourmet dinner foods. By hosting a morning wedding, you’ll not only get to take advantage of cheaper rental rates, but you’ll save a bundle on your food bill, as well. And you’ll also fare well on your alcohol bill since people are less likely to drink in the morning. Cheap Flowers: When ordering flowers, remember a couple of things: stay in season and stay common. Exotic flowers will cost you a pretty penny. But you can also cut costs by ordering from wholesale distributors rather than local florists. Try to avoid extra fees if you can. Embrace the Odd Hour: One way to avoid the issue of food all together is to hold your ceremony and reception at an odd hour. Try 2 p.m. or late at night. That way most people will have already eaten and likely not be concerned about food. All you have to worry about are the beverages. Cash Bar: Cash bars at weddings are often thought to be no-nos, but frankly, liquor, wine and beer will end up comprising about 25 percent of your total bill if you pay for an open bar. It’s totally acceptable to make people pay for their own alcohol. To make this less of an issue, have an afternoon ceremony so people won’t be focused on drinking as much. Another option is to offer a cheap wine and beer for free but charge for the hard stuff. 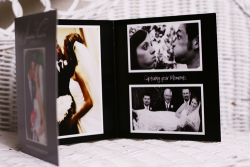 When picking a wedding photographer the one thing that can coast the most is the wedding album. Some photographers do not even offer this as an option for the lower packages. So, if you are on a budget or just don’t want to pay an arm and a leg for your album, you may want to check out the blurb.com. This is an online book publisher. They offer many options of books that you can choose from starting as low as $12.95. All you need is the high resolution images from your photographer and you can design your own book with there templates. I highly recommend getting the high res. disc of your images for a few reasons. The first is that you are able to make prints for whoever you want whenever you want without going back to the photographer—which prints are a lot cheaper this way! Also, in case the studio goes out of business or a natural disaster happens you have a hard copy of all your images. The last reason is you are able to make tons of things with the disc and totally utilize all of your pictures. You can make calendars, thank you cards, and many other items for half the coast the studio would charge you. Another idea is to get the high resolution disc of your engagement session and go onto the blurb.com and make your own guest book. You can have your engagement pictures on the pages that everyone will sign and have them do it yearbook style or add lines for them to sign on. It makes a truly unique guest book that you will want to look at! Check out blurb.com! If you are looking for a way to save money on your flowers for the reception, here is a great idea. Instead of buying flowers especially for the bride and grooms table repurpose the bouquets from the wedding. 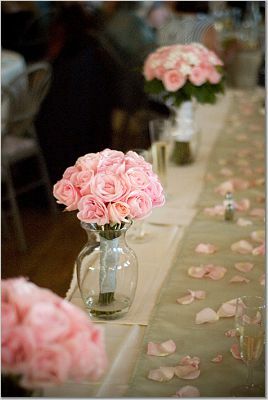 Have vases set out along the table and place the bridesmaids’ bouquets and your wedding bouquet in the vases. Decorate in-between the vases with tons of votive candles. Another option is to pile all of the bridesmaids’ bouquets in the middle of the table and place your on top. It will become a beautiful mound of flowers. You would also surround these with votives, to make it blend with the rest of the decorations. This is a great way to repurpose your bouquets and get your money’s worth! Idea from my girls at the Knot! If you are looking for votives for your reception then I got you covered. 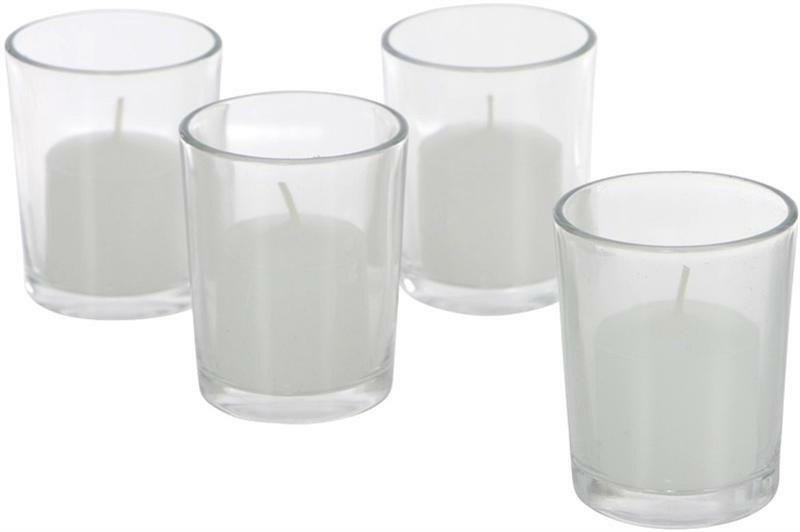 Here is a great price on votives. You get 144holders and 144votives for only $80. That makes then around 50cents each. That is a pretty good price and the more candles you have the more inviting your reception will be with out spending a ton of money on flowers.Check it out! Pearls have become almost a staple for brides around the world and deservedly so. Pearls are a symbol of purity and elegance. However, buying pearls can be a tricky thing. Faux pearls are often very well made, which makes it very hard to tell if you are buying the real thing or not. Faux pearls can be distinguished by their name: simulated, faux, glass, plastic, resin, artificial, manmade. There are two kinds of real pearls—natural and cultured. Natural pearls are very rare and very expensive; one of the only ways to tell a natural from a cultured is with an x-ray. Both kinds go through the same process, however the cultured pearls has a little help from man. That said cultured pearls are still real pearls and they make up the majority of the market. Cultured pearls can be freshwater or saltwater. Typically saltwater pearls are more expensive. Freshwater pearls are available in a far wider color range than saltwater, including purple, violet, orange, blue and gray. They are cheaper to produce as each mollusk can yield up to 30 pearls per harvest! To further confuse things, there are also shell pearls and genuine pearls which have had treatments applied to them, such as coatings or faceting. In general, the highest prices will be paid for large, round, well colored, unenhanced gems. Factors that influence value in pearl jewelry pieces would add to these general considerations, quality of stringing and degree of matching in size and color. To get the most out of your money, you need to make sure you know the quality of the pearls you are buying. Here are some ways to tell. 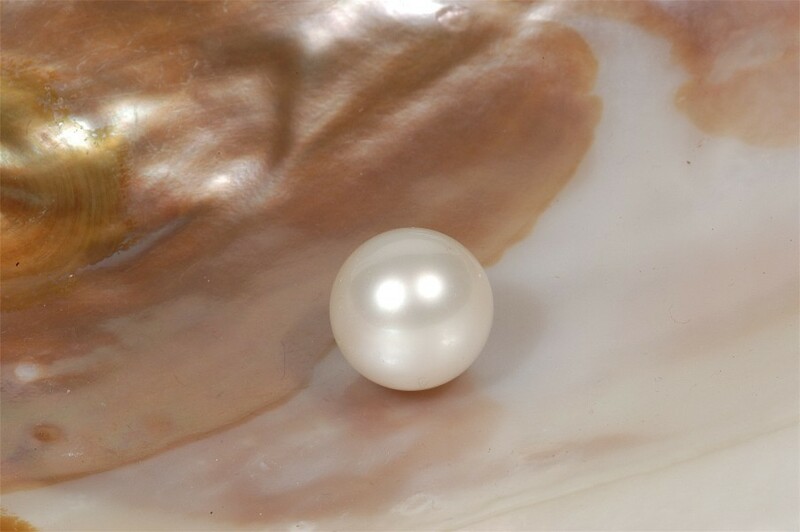 Real pearls are heavier for their size than plastic, resin, or hollow glass pearls. Good glass fakes will have the same density are real pearls. If you have a light pearl, it is defiantly a fake. Since good fake pearls are made the same weight as real pearls you need a few more ways to tell. Faux pearls tend to look ‘flat’ in comparison to the real thing. There are exceptions, of course, with beautiful simulated pearls. However, real pearls tend not to be perfect and may have bands in their nacre, bumps, ridges, or pits. They vary in size and shape from one to another. Real pearls come in many shapes, but they tend not to be perfectly round, so a perfect sphere should be suspect. Expensive genuine pearls may be round, but you will have other clues to help you make a determination. Some fakes are made to look irregular, and glass pearls often have flattened ends or slightly oval shapes. Do they warm to the skin? Hold them under the sun. Take your pearls out into the sun or hold them under very bright indoor lighting. Unless they are very expensive, genuine pearls won’t be perfectly matched under the sun. You will be able to see variations in their iridescence (orient) and color. If the pearls are perfectly matched for color and overtones, they are most probably faux. What kind of settings does it have? Pearls are sensitive to heat, chemicals and abrasion, they should be stored in a cloth bag or their own box away from contact with other materials. They should be protected from chemicals such as hairspray and perfume. Wiping them with a damp cloth after wearing and occasional cleaning in mild soapy water is all that’s required. Check out my source for more valuable information on pearls! 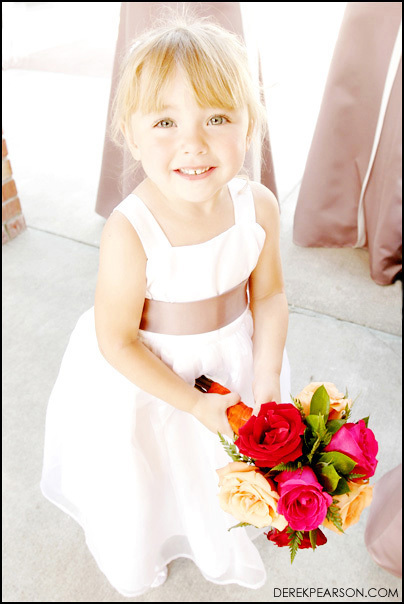 Who Pays for the Flower Girl’s Dress? Traditionally the little one’s parents pay for the dress. However, times have changed and sometimes the bride and groom fit the bill as an act of gratitude. If the parents are paying for the dress try to keep the dress in their price range. You may offer a choice of a few dresses so that they can choose one that is more in their budget. Keep in mind that the Bride and Groom do pay for the flower basket, any petals for the basket, and any flowers that you want in her hair.